Gearing up for an escape to paradise in the next few weeks? 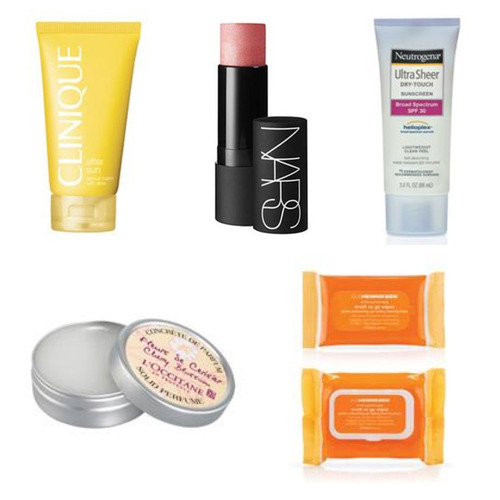 Swap out your regular makeup for these portable travel-sized essentials. We’ve got you covered for everything you need – consider this guide your vacation beauty checklist. Not willing to give up your foundation, but fear it spilling and creating utter disaster in your makeup bag? BareMinerals has you covered. The mineral technology ensures this compact is mess-free. The hydrating coverage also contains SPF 20…perfect for a sunny destination. With your glowy tan, you won’t need to load up on makeup. Keep your routine simple and stick to a multitasking product, like NARS’ The Multiple, which you can use on your eyes, lips, cheeks and body. Enhance your natural beauty! Waterproof mascara is a non-negotiable must-have when it comes to vacation makeup. Try this volumizing one by new Pamp obsession Inglot. We know the importance of taking care of your skin at Pampadour. Please apply sunscreen regularly while enjoying your vacation – we adour this classic by Neutrogena. Soothe your skin after a long day sitting out in the sun with a calming lotion, like Clinique’s After-Sun Rescue Balm. Use the oil-free lotion on both your face and body. A loophole to those pesky TSA rules? Solid perfume. L’Occitane’s solid perfume in Cherry Blossom is perfect for touch-ups. Keep it in your travel bag, and bring it everywhere from the pool to dinner. Ole Henriksen’s Truth to Go wipes are strong enough to remove any makeup, but gentle enough that it won’t dry out your skin. Plus, it smells like delicious citrus vanilla…yum!